With 60 patio homes and 135 townhomes in what may be the best view location in Las Vegas, Desert Shores Racquet Club is a truly unique jewel in the desert. 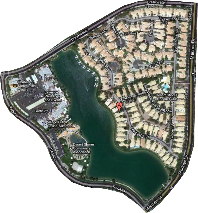 Placed in the exact heart of the Desert Shores Master Association, the Racquet Club nestles directly across Lake Jacqueline from the Desert Shores Lagoon. Lake Jacqueline is the largest of the four Desert Shores lakes, encompassing 24.8 acres and running 1.1 miles from southeast to northwest. Further, the Racquet Club is situated on the widest part of Lake Jacqueline. It offers spectacular water and mountain views in the daytime, paired with an artistic, lighted lakescape at night. Unlike any other community in Desert Shores, every Racquet Club resident has unrestricted access to Lake Jacqueline along a wide green belt / park that runs the length of the community. Residents may fish along this shoreline, watch the varied seasonal waterfowl, or just soak in the ambience that comes with being in such a soothing but fun setting. If you like, you can just sit and watch the lake, feeling your blood pressure drop as you watch black swans, egrets, great blue heron, cormorants, grebes, Canada geese and many other birds take advantage of their good fortune in finding this oasis in the desert. Or you can enjoy a beach-like setting during events at Desert Shores, when revelers, boaters and picnickers far across the lake enjoy the primary recreation area of the master community. You might even use your own boat by taking off from one of the private docks available to residents (all are owned by existing homeowners, but many are unused and might be rented). At night, you might be treated to an evening jazz concert coming from Garfield’s or Marché Bacchus at the elegant Lakeside Center across the lake. As darkness falls, the lighting at the Desert Shores Community Center and the Lakeside Center is gorgeous reflecting on the water, offering one of the few truly great residential nighttime vistas in all of Las Vegas. Unique among communities in Las Vegas, the Racquet Club offers much more than just a house. The most obvious difference is access to a large community lake, but the advantages don’t end there. The community has two large clubhouses. The Sail Club is situated on the prime portion of the lake and may be rented by any homeowner for parties or family events. It has a large entertainment space, a full kitchen and large, clean restrooms. The Racquet Club (the building, not the development) greets arrivals just inside the main gate. It has a full racquetball court, an indoor basketball court, weightlifting and fitness facilities, lockers, a full kitchen, large clean bathrooms, an enormous and beautifully-lighted outdoor pool, a 10-person hot tub, showers and more. It is seldom crowded and offers many ways to, again, lower your blood pressure. There is ample opportunity for walking inside the community with its quiet streets and a landscaped central walkway between the lake, patio homes and townhomes. Outside the development, the four lakes and miles of sidewalks of Desert Shores beckon walkers, runners and bike-riders. Finally, the Racquet Club is a gated community, with a guard house and nighttime guard. There is a resident gate separate from the vendor gate, allowing easy access for residents but controlled access for anyone else. The Racquet Club has smaller homes with novel architecture and privacy. Each patio home has a private side yard that is invisible to neighbors. Inside, rooms take advantage of angles and open space to create several different private environments. In most homes, attention has been paid to bedroom suites that are removed from each other and have their own bathroom. Outside, the Racquet Club has a strong sense of community. Neighbors tend to know each other, talk to each other and help each other. You have privacy when you want it but help when you need it, a combination rarely seen in a large city. Please look through the rest of this site for all the Desert Shores Racquet Club has to offer.